hoy os enseño una idea que hemos llevado a cabo para todas las bodas que se nos avecinan y que creo que os puede gustar. 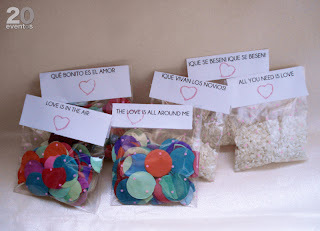 Hemos hecho paquetitos de celofán para rellenarlos de arroz, pétalos o confetti y llevan incorporados distintos mensajes de amor. Sería para utilizarlos a la salida de la iglesia o al terminar la ceremonia civil. ¿os gusta la idea? a nosotros nos encanta!! 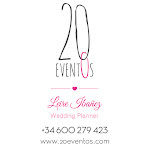 today we bring you an idea that we have developed for all those weddings that we are preparing for this year and I think that you will like it. We have done small packages of cellophane to fill them with rice, petals or rice. These packages are closed with love messages and are used to throw them to the bride&groom after the ceremony. Do you like it? We love it! !